In my cooking classes I will often ask how long people have had their Thermomix and invariably someone will tell me they consider themselves a newbie. On further enquiry, they may have had their machine for any time ranging from a delivery literally that day to as long as up to a year. 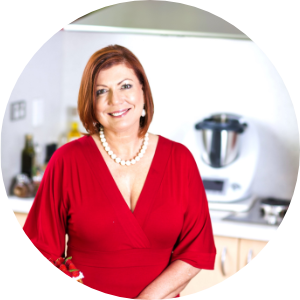 Either way, they still claim to be new to the world of Thermomix and are seeking more guidance or assistance to get the most out of their purchase. Newbie or not, you can become very organized when it comes to making basic ingredients using a Thermomix. You can pretty well make almost anything from peanut butter to Thermomite (the love child of promite and vegemite), from jams to curry powders, from mayonnaises to mustards and we’re all still hoping someone gets the wine making thing sorted. OH and let’s not forget the ubiquitous Umami Paste. What’s Umami Paste I hear you cry? We have included the recipe here for you to freeze into ice cubes and add to all things that need a flavour boost. So think stews, bolognaise, soups, curries. Anything savoury could probably benefit from a Umami hit. Umami is the fifth flavour and the paste recipe is an additive free, healthy version of MSG. Yep. Home made flavour booster. Then of course there is milling your own sugar down to a finer grind, so that you really only need to have one kind in the pantry. Or making your own gluten free flours, nut milks, almond meal. All at a fraction of the cost of purchasing these things ready made. So why go to all that trouble? Why make these fairly common place ingredients before you even begin your regular weeknight cooking? It is not always the case, but very often these basic pantry items are not only fairly bland in flavour, they are laden with preservatives and additives and numbers. If you are keen to feed your family additive free flavoursome food, it can all come unstuck with the little things sometimes. Planning a day of pantry replenishing every so often, is really a great idea and you can rest assured that whatever you whip up at a moments notice with your stock of fridge/pantry fixin’s is still going to meet your impeccable standards. Plus it is going to add a punch of flavour that cannot compare to a bought substitute. And no one is complaining about that. No-one.